It's Thanksgiving week here in the U.S. so I almost didn't play along this week. I thought I just wouldn't have time. But, guess what!!! I found time just before the deadline. This is a theme challenge. And the theme is . . .adventure!!! Adventures in my family almost always have something to do with the outdoors and often have something to do with hunting and/or dogs. So, a card having a dog on point seemed perfect for this challenge. What would be an adventure in your life? It's almost here--Cyber Monday and the second 24 hour sale of Online Extravaganza. Don't miss out on these great deals. Here are some pics of the cards I made using the Flurry of Wishes bundle that is on sale during tomorrow's 24-hour sale. Don't forget Cyber Monday is that last day of the Online Extravaganza. If there is anything on your wish list, let you family know and have them contact me so I can help them get it ordered and help with a surprise. Don't forget if you order gifts from me, and get them to me to wrap before December 15, I will provide special wrapping FREE. 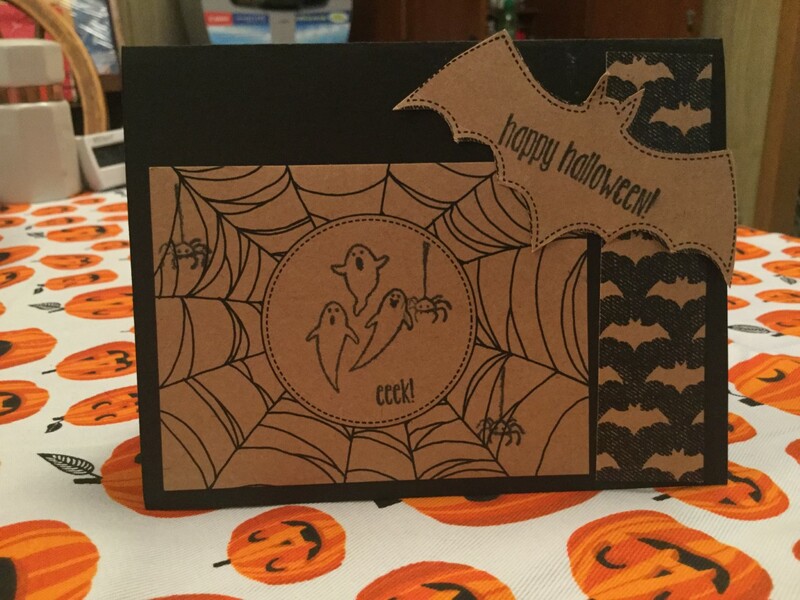 In the previous post, I shared pictures of some alternate card designs I made with my Paper Pumpkin October 2016 kit. I got most of these ideas off Pinterest so I can't take credit for these. There are so many talented artists out there who are willing to share so many of their creative ideas on Pinterest. So, if you choose to sign up for Paper Pumpkin, be sure you check out the creative alternate ideas you can find on Pinterest. I have created a video showing me making an alternate Paper Pumpkin Project. Since some Paper Pumpkin kit are available to EVERYONE this week, I will make this video available to EVERYONE. In the future, I will be making a video about Paper Pumpkin alternate projects each month, but that video will only be available to customers. Happy Thanksgiving! Enjoy the day with your family and don't forget to visit the Online Extravaganza when you're Black Friday shopping tomorrow. Enjoy these photos of Paper Pumpkin October 2016 Alternate Thank You Cards. They are all for you. 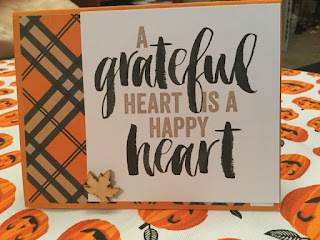 I am thankful for you, my friends, my customers, my blog readers every day of the year. Today I want to talk about Project Life. 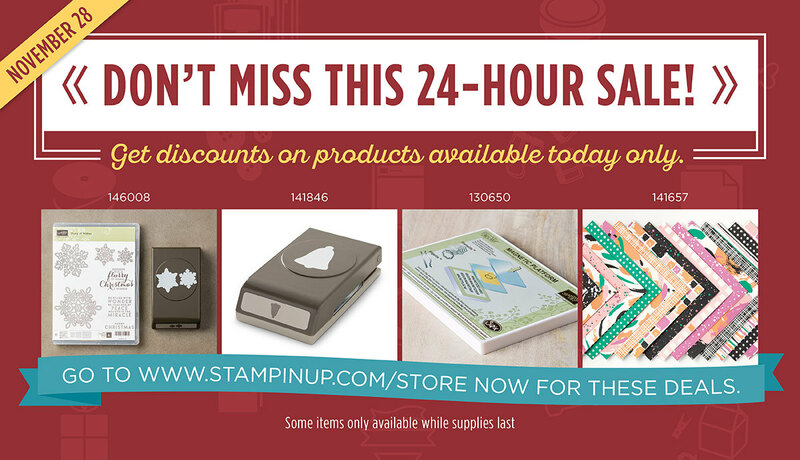 Stampin' Up does not only have card supplies, it also carries the Project Life series to help with memory keeping (or as I always called it--scrapbooking). Those who know me know that my first love of paper crafting was scrapbooking. And, my favorite scrapbook magazine was Simple Scrapbooks with editor Becky Higgins. Imagine my delight when I discovered Becky Higgins has developed a plan to make scrapbooking less daunting and more achievable. 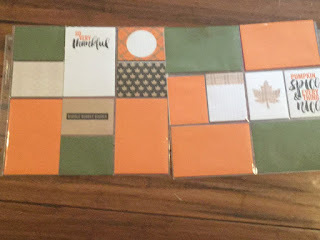 That system is called Project Life and Stampin' Up has joined in on the excitement of their product. What is even more exciting is that Hello December 2016 is part of the Online Extravaganza. This is an awesome way to be introduced to the Project Life products. They can be used for memory keeping or even for making cards. I don't personally have the Hello December 2016 set yet, but I do have the Seasonal Snapshots 2015 set that is now available on clearance. 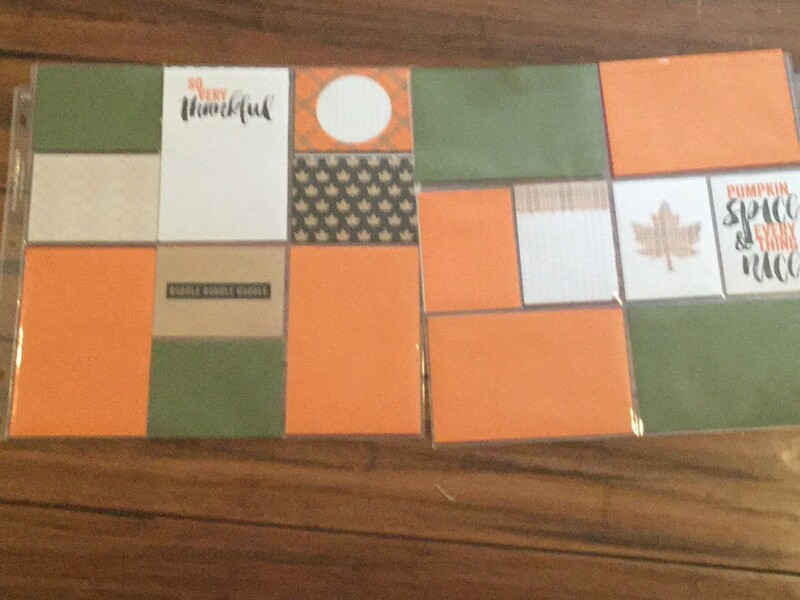 Here are some examples of cards that I made using the Seasonal Snapshots 2015 set from Project Life. I also spent some time today preparing Pocket pages with my Seasonal Snapshots 2015 Project Life set. Now, I am all ready to print and put photos in after our holiday celebrations and add a few embellishments. The photo mats are even all ready to go. There are several designs of pocket pages available with spaces available for the exact sizes of cards in each Project Life set. If you want to continue traditional scrapbooking, there are also 12x12 page protectors available in the Project Life series as well. 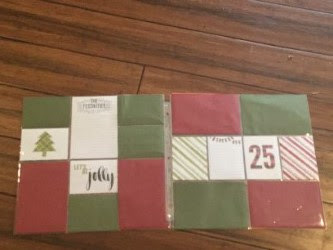 If you want to see the Hello December 2016 Project Life set that is on sale during the Online Extravaganza, check out this video. If you'd like different products to create your Christmas cards this year, there are lots of great holiday options on sale this week. The Stitched with Cheer set is also on sale this week. 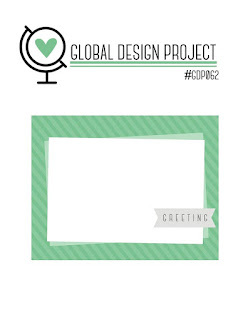 It contains everything you need to create 18 amazing cards (6 each of 3 designs) except adhesive, ink, and stamps. The good news is the Stitched with Cheer stamp set that coordinates with the cards is also on sale this week. As you are shopping, pay attention to the products marked as retiring. 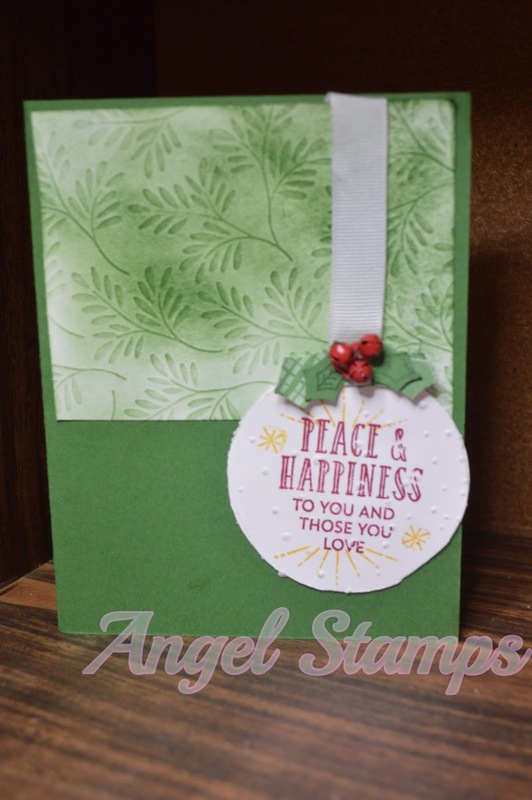 The Fancy Frost Specialty Designer Series Paper, mini Jingle Bells, and Stitched with Cheer Stamp Set are all marked as retiring along with several others. I loved playing with the Mini Jingle Bells so much that when I saw them marked as retiring, I had to order two more sets to ensure I can play a bit longer. Have fun shopping this week and let me know if I can help you in any way. I wanted to make a fall nature scene with pumpkins, but did not have a pumpkin stamp. So, I began looking through my stamp sets for the shapes needed to create pumpkins. Can I just say how much I love the Swirly Birds Stamp Set. It is so versatile and has amazing stamps that can create an infinite number of cards. I was able to use stamps from that set to create pumpkins with stems and leaves in a patch of grass. Here is a picture of the first attempt at this card. I added some Halloween Designer Specialty Paper, the cardstock base to Early Espresso, and the ink color to Pumpkin Pie. I'd love some feedback on the changes. What do you think? Which design do you prefer? Does it need anything else added? Online Extravaganza starts at 12:01am Mountain Time. I am so excited about this week of sales, I am almost tempted to stay up until it starts. I did say almost--I will be asleep long before that happens. 😉 And, I want to give all of you time to see if you want to join me in placing an order. So, I will be placing my order tomorrow evening. You have until around 6:00pm if you want to add to my order. That's a great way to share shipping costs. You can also share shipping costs with a friend near you. Don't forget, if you spend over $150.00 you will earn rewards. The first 24 hour sale has some great bundles available that were created especially for this sale. One of them is a bundle of Enamel Shapes. I will be attaching photos of some of the cards I've created using Enamel Shapes so you can see some ways they can be used. The gift bag and gift box punch board are also on sale during this 1st Flash Sale. Those would be a great way to use some of the great paper that Stampin' Up offers to make really special gift wrapped packages for Christmas. I would encourage you to definitely take advantage of this sale if you took advantage of the Designer Series Paper Sale this fall. 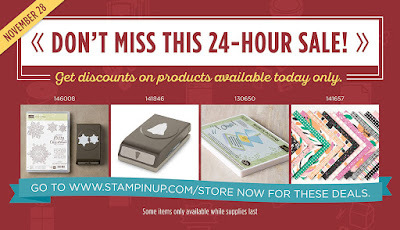 To check out what's on sale, check out this link: Stampin' Up Store. Don't forget to enter my name as a demonstrator and/or contact me to help with your order. Here are the samples of the cards I've made using Enamel Shapes. I hope you are inspired by what you see to create some masterpieces of your own. I would love to see your work. Please send me photos of the cards you create so I can be inspired by your creativity as well. It is the time of year when giving thanks is talked about and is on the fore-front of everyone's mind. If you know me, you know that I don't consider thankfulness a seasonal attitude. I think gratitude is something that should be at the fore front of your mind year round. So, I will not only be posting thank you cards during this month, but also off and on all year round. Won't you join me in not only being thankful all year, but giving thank you cards to friends, family, and random strangers all year. I'm hoping to get some made to carry with me and give to cashiers, wait staff, doctors, nurses, neighbors, and strangers throughout the year. Join me as I spread thanks all year. I am still having so much fun playing along with the Global Design Project. This week was a color challenge and I had to wait until the colors were announced to see if I could play along. I was so excited that I happen to have this week's colors. 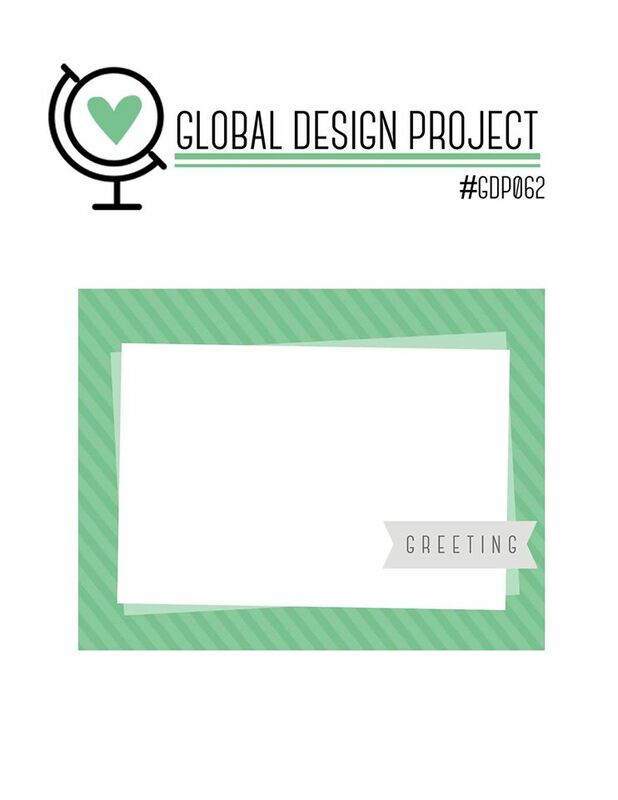 It is so much fun for me to spend the time designing a card for this project. I'm going to let you in on the creative process a little but. I begin thinking about what I wanted to do as soon as the project was announced. Somehow, I felt like I wanted to create a card with a frog stamp. However, I do not have a frog stamp. So, I started thinking about how to create a frog using the stamps I do have. Most frogs in real life have more of an organic shape than geometric and would be hard to recreate with the stamps at my disposal. Then, I remembered a toy frog that my children had made with just circular shapes and suddenly I knew what I had to do. Swirly Bird stamp set to the rescue once again. I was able to make what I think is a pretty cute frog out of stamps from the Swirly Bird stamp set. 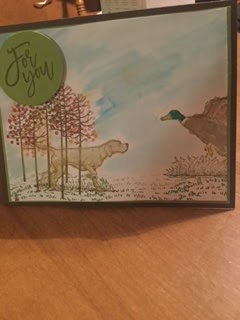 It was so much fun to put a background stamp, paper layers, and accents in these great colors. 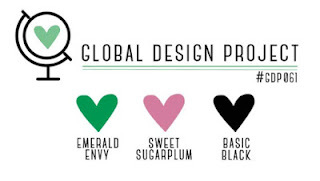 I love playing with the 2016-2018 In Colors and love that this project had us using two of them with black. I know that circles with the Bigshot are on my wishlist for my next big order. That will definitely make life much easier and my circles more precise for cards in the future. Freehand cutting circles is more time consuming and less precise than I like. I had such a good time playing along with #GDP061 this week. 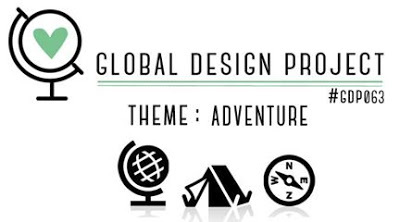 To check out all the entries, please check out Global Design Project here.